Hat tip to Quartersnacks for the Skateboarder news. 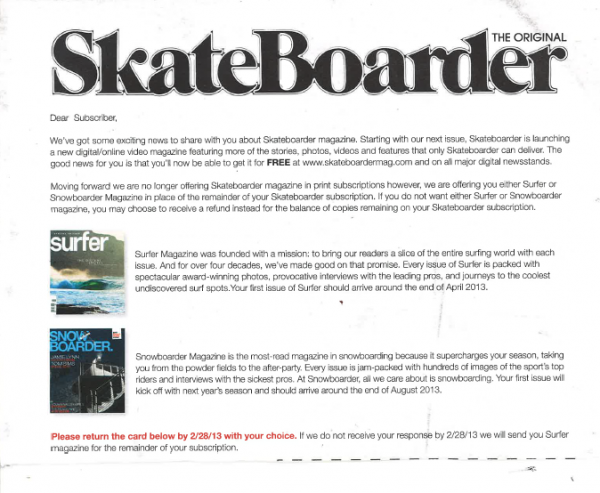 A friend mentioned late last year that he wouldn't be surprised if one of the major skateboard magazine folded in 2013. I agreed that it wouldn't be too shocking, and memory banked the prediction. Here we go, sort of. Skateboarder (or, as they seem to insist, "SkateBoarder") has always been rather elastic when it came to its format, having dynamic production schedules and sizes since it was resurrected in '97, so a switch to a bi-monthly hard-copy publication schedule coupled with an increased online presence as a "digital/online video magazine" isn't a surprise. In hindsight, one could have almost telegraphed the switch when the magazine (or more likely, publisher, GrindMedia) obtained the rights to 411VM, last year. Truly, the only wholly-unexpected and/or ill-advised move here is GrindMedia offering fill-in subscriptions to snowboard or surfing mags to placate their jilted Skateboarder subscribers. Jenkem has a new piece about indy skateboard companies which is well-worth the read. While corporate shoe companies guide a lot of conversation right now, it's instructive to remember that shoes weren't a huge focal point of the skateboard industry until the early 90's; it's my humble opinion that we'll always need boards more. If I have one quibble with the piece, The High Five is now Send Help. Since it's STILL winter, don't be surprise if I link to another park montage, like right now: Reed Allen and co. at the HQ. At the very least, we're given two different character studies on skating the same place. y'all are slacking, dudes been ripping forever.